I started writing about the Royals on a whim. I was a new at-home dad, and while the boy kept me busy, I also had some time on my hands when he slept. I filled a lot of that time watching and reading about the Royals. I joined Twitter with the idea that I would just follow Royals fans without posting myself. 1,300 tweets and a bunch of blog posts later, I found myself with press credentials, interviewing Ned Yost, Jeff Montgomery, Eric Hosmer, Ryan Lefebvre and Dayton Moore last night. Your Royals DH for the evening: .268 OBP, 87 K, 8 BB. He's been designated to do some hitting tonight. For an often cooped-up Royals die-hard, the internet became an important way for me to be able to connect with other fans. Again on a whim, I set up a blog to serve as a virtual dumping ground for baseball research and thoughts I wanted to get off my chest. Then came an offer to write here on I70Baseball.com, and things got more formal with a weekly deadline. The whims have turned into what I guess you would call a serious hobby. 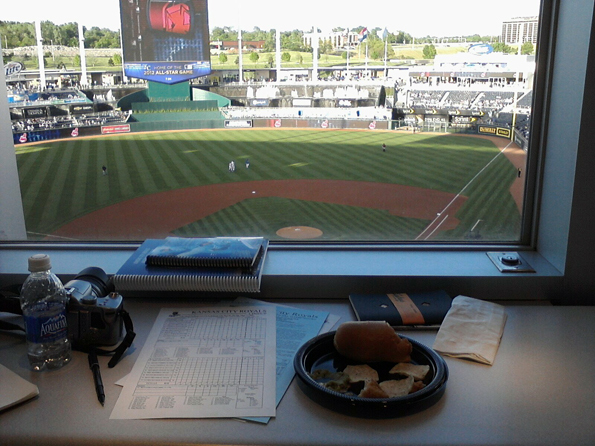 While I have enjoyed the ride, I have never taken myself too seriously as a Royals blogger, which added to the surprise when I got the call that I would be participating in the first “Blog Your Way To The K” event. Lead by media mavens Mike Swanson, David Holtzman and Erin Sleddens, the Royals are taking progressive steps to allow social media users some serious access to Royals figures. It started with the Digital Digest last winter, where bloggers got the chance to interview Moore, Yost, Billy Butler and Jeff Francoeur. Last night’s event was the first of its kind at a game, but we were told they will host one or two more this season, and could very well be moving towards a full-time social media section in the vein of the Indians Social Suite. Our evening started with comments from Mike Swanson, VP of Communications and Broadcasting and 33-year veteran of MLB media relations. Swanson calls himself a “dinosaur,” but we should all be so willing to embrace change after becoming seasoned veterans. After thanking the higher powers that the previous night’s 19-1 loss was not blogger night, he told us, “Blogs are every bit the promotional entities the Kansas City Star or Sports Illustrated are. We read your stuff. That’s how you got here.” Swanson told us they do not mind criticism—they just prefer that it be informed criticism. 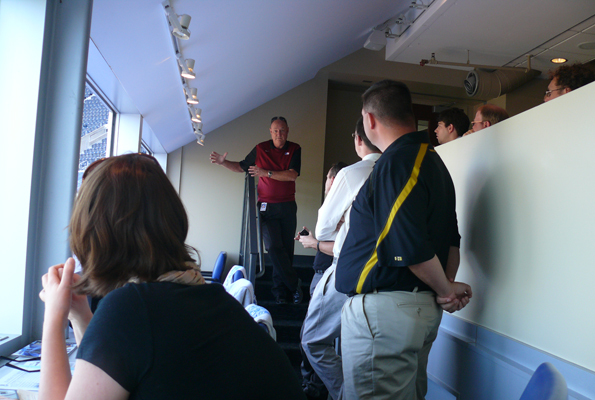 Swanson took us down to the Royals dugout where Ned Yost was finishing up his pre-game scrum with the mainstream press. Yost graciously agreed to have a quick bull session with the bloggers afterwards. He told us that dealing with the media is not his favorite thing to do, and having to rehash the previous day’s game is a particular challenge for him since he would prefer to look ahead. I asked him what the ideal usage for the two bullpen lefties would be now that Everett Teaford has joined Tim Collins. Yost responded with specifics: he recognizes Collins is not a lefty specialist, calling him “more of a blend” since he has success against righties. He said he will not limit Teaford to being a lefty specialist, but Yost likes his sweeping breaking balls against left-handed hitters, and will probably call on him when lefties are “stacked” together, while Collins will be the man when there are alternating lefties/righties coming up for the opposition. Jeff Montgomery was up next, greeting us with a cheerful, “Hi bloggers!” Monty looks forward to seeing Joakim Soria break his Royals saves record, and feels he will “definitely” do it if he can stay healthy. He pointed out Soria has a nice head start—Monty was not the Royals closer until he was 27, whereas Soria has racked up 138 saves and is turning 27 today. (Soria still has a long way to go to catch Monty’s 304.) Montgomery told the pre-game audience on Fox Sports that he learned the bloggers do not all live in their parents’ basement. 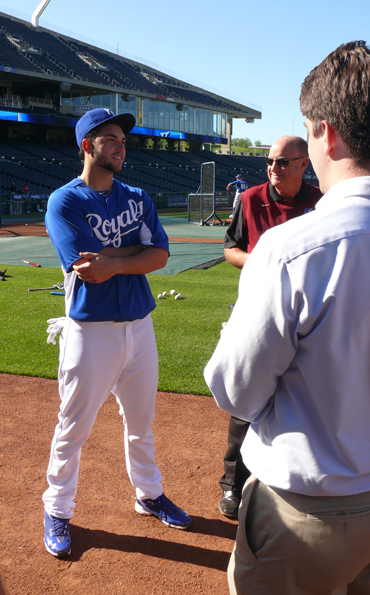 Hos's favorite word is "unbelievable"
From there we got to enjoy Royals batting practice from the field, and some guy named Eric Hosmer agreed to talk to us. He is loving life right now, and was excited about his recent Omaha teammates Teaford and Danny Duffy joining him in Kansas City. He has been giving his mom a hard time about getting more TV time than him after her endearing, weak-kneed, “Oh my God!” reaction to his first MLB home run. Ironically, it has taken Swanson’s encouragement and tutelage to get the 21 year-old tweeting. We headed back to the Joe Burke Suite just off the main press box, where Fox play-by-play man Ryan Lefebvre met with us. He said he does not get a chance to read much Royals talk on blogs or Twitter due to the time constraints of his usual game prep along with being a husband and father. Our next visitor was the man, the myth, the legend: General Manager Dayton Moore. When asked about the financial implications of bringing up Hosmer and Duffy early in the season, Moore replied that those concerns are secondary to winning. He also allowed that the moves build a trusting relationship with the players that could pay off with them wanting to remain Royals. Draft preparation is taking up a lot of his time right now, and he said the Royals have a list of “10 to 12” guys they are looking at taking with the fifth overall pick. I asked his take on the potential for the draft going to a strict “slotted” signing bonus system for draft picks; he said he cannot say too much about his opinion on it, but that he is on the committee taking a look at it, so his thoughts are being heard within MLB. He did say he likes the flexibility of the current system. Another interesting tidbit is that plans call for Duffy to throw a total of 160—180 innings this year (he threw 36 in Omaha before his promotion). All of that was enough to make for quite a day—but apparently there was still a baseball game to be played, which felt almost like an afterthought to the incredible pregame activities. There were not a lot of highlights for the home team as they dropped their fourth straight. We did get to see Hosmer’s first career triple and a slick double play started by a diving Mike Aviles. The best moment was Teaford’s debut—debuts are always a treat, and Teaford’s first inning was especially nice with a quick three-up, three-down. The Royals made some groan-inducing outs on the base-paths; the team’s aggression in that area even when down by five runs was a little puzzling. 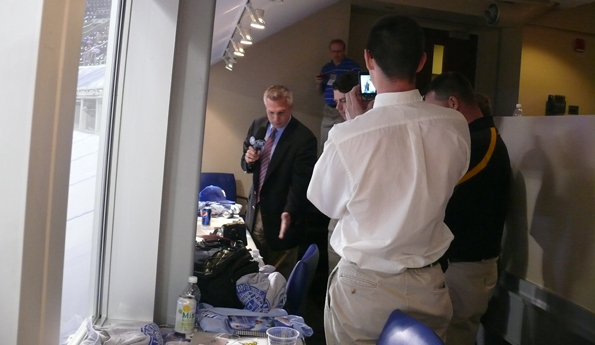 We got another visitor in the booth when Joel Goldberg stopped by and did a portion of the Fox Sports broadcast from our suite. 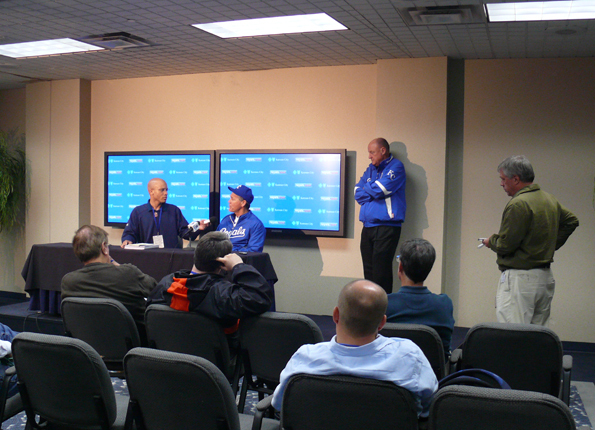 After the game it was down to Yost’s press conference. He was not in a great mood after the loss. He explained the aggressiveness on the base paths by saying you cannot sit back and wait for home runs in huge Kauffman Stadium. The money quote was, “Winners battle through adversity. Losers freaking lay down and quit.” After the mainstream press got their questions in, Swanson opened it up to the bloggers huddled in the back. We did not seem to have many questions left after our long, whirlwind day. Mike Engel of Kings of Kauffman redeemed us by asking if Yost was noticing anything different about the swing of slumping Alex Gordon. Yost does feel Alex is “pressing a little bit,” which might be leading to him “getting a little long” with his swing. Yost proposes that the Royals not "freaking lay down and quit"
I felt a bit torn throughout the whole experience—was I a fan or was I media? Was it OK to cheer during the game? I did not cheer much, but that was partly due to the thick window in front of me—no one would have heard it anyway. I had entered a weird gray area somewhere in between. The team’s media people are trying to figure out this strange new landscape right along with us. Regardless of where writing about baseball in Kansas City takes me, I expect I will always be a fan first. But I cannot deny I could get used to player and staff access and official press game notes, a media guide and a score-sheet with the line-ups already filled in waiting for me when I show up to a game. It is a night I will never forget, and I cannot thank the Royals enough for having us and being such great hosts. In the end, I regard the whole thing as the ultimate reward for my passion for Kansas City baseball. Go Royals. Nice post. I’m glad to hear it went well. I’m torn about this too – are the Royals actually acknowledging the loyalty and fanaticism of bloggers and showing them respect, or are they trying to wine-and-dine bloggers to try and “tame” them so their posts will be more franchise friendly by trying to engender relationships with players and management? Also, do you think “blog your way to the K” will be just a one time thing? Once a year? Will it perhaps create more access for bloggers beyond just once a season? Would you even WANT more access? Regardless of the future of this program, it’s great to see some recognition for voices outside of “old media”. I think mostly what they are acknowledging is the promotional advantages of allowing bloggers into the fold. Just like the mainstream media, it costs them little to host us and they are rewarded by the Royals profile being raised when the team is reported on. I don’t think they’re trying to “tame” the blogosphere. Swanson’s comment about preferring informed criticism was telling I thought. They said there will be at least one more blogger night and possibly two this season. Erin Sleddens, whose title is Director of Online & Targeted Marketing, made it sound like they are moving towards having a full-time area for “social media,” and specifically mentioned the Cleveland Indians current program as the model. As for whether I want more access…I wasn’t sure before last night, but like I said in my post, I could get used to it! I’m jealous. But way to make us proud, Aaron! Thanks Todd. They seem to want to keep events like these going, so you might get a shot! Great post Aaron. It was a pleasure to meet you Tuesday night and look forward to continuing to follow your blog. It was a great experience and I agree that it seemed as if the Royals are planning to do this again in the future. Thanks Eric – Really enjoyed your post and meeting you too! it was a hell of a night.